While a divorce is essentially a civilian matter, there are certain aspects of military pay and benefits that need to be considered when dealing with a marital separation or divorce where one or both members are in, or retired from, the military. All too often, I hear from one party who got the short end of a divorce, usually by accident and because the two parties and their lawyers didn’t have a thorough knowledge of the things that had to be considered. The big thing to remember is that the divorce is not run by the lawyers, or by the judge(s), unless the two parties who are divorcing can’t agree. I’ll tell you that in 98% of the cases, the outcome is going to be faster, cheaper, and better if the divorcing spouses work this stuff out between themselves and don’t let their lawyers fight it out. I’m not sure how we got to the point where letting the lawyers handle the divorce seems like the norm, but it shouldn’t be. If working together is hard, then the first step should be a mediator to help the two parties come to a mutually agreeable solution. I’m not saying you don’t need a lawyer – you absolutely DO need a lawyer – but the lawyer should be the last-stop, look-it-all-over, not the hash-out-every-detail. Obviously, there is a lot of stuff that needs to be considered, including custody of the children, child support, who will live in the house, who gets the iTunes account, etc. I’m just here to talk about things that are unique to the military. If I had to pick one thing that former military member and former military spouses most often regret, it is something that was decided in their property settlement. Often, important details are overlooked either because the two parties are in a hurry to get the divorce over with, or because one or both the parties and/or their lawyers didn’t consider all the little things. boats, RVS, ATVs, motorcycles, etc. The goal is to come up with a plan that is fair to both parties. Finding a compromise between the two parties can take time and patience, but the resulting property settlements reflect the priorities and unique situation of the two people divorcing. That’s the goal here. When the couple can’t work together, then it becomes necessary to involve lawyers and judges. This makes the process slower, more expensive, and can result in some undesirable outcomes. While every couple needs to divided their property, the stakes are high if military retirement pay is one of the marital assets. There’s no right or wrong answer to if and how military retirement pay can and should be split, and it isn’t required – the federal law only permits state courts to divide military retirement pay. If the couple, or a judge, decide it is appropriate to divide earned military retirement pay, it is important that the directions are written to actually direct the intent of the division of pay. If you don’t consider all the nuances, it can be easy to mess this up. Thankfully, the Defense Finance and Accounting Service (DFAS) offers a sample order that can be used to draft your individual paperwork correctly. Most importantly, you have to completely understand all the rules, particularly regarding the impact of disability benefits on military retirement pay. If a retiree receives disability compensation, their military retirement pay may be offset by the amount of disability compensation. This affects the amount of military retirement pay available to be divided. It’s also important to note that any new divisions of military retirement pay are subject to the rules change set forth in the 2017 National Defense Authorization Act. Under these changes, the division of retirement pay must take into consideration the rank and time in service at the time of the divorce – not the total amount of retirement pay that is eventually paid. Once again, there is no requirement that military retirement pay be divided, and there’s no set formula used. It is up to the two parties, or, if they can’t decide, the judge that handles their case. If a division of marital property is ordered, and the couple has been married at least 10 years that overlapped with 10 years of military service, then the payment can be made directly from the DFAS. If the marriage had not lasted 10 years, or did not overlap with military service by 10 years, then any ordered payments must be paid by the retiree. 20 years of marriage that overlap with the military service. Spouses who remarry lose their 20/20/20 benefits. Medical coverage is lost permanently; shopping and other benefits may be reinstated if the subsequent marriage ends due. It is important to note that the Tricare coverage is not available if the former spouse purchases employer-sponsored coverage from their own employment, but they are not obligated to purchase such employer-sponsored coverage. Because of the value of these benefits, particularly the Tricare medical coverage, divorcing couples who are nearing this threshold may want to delay the actual divorce. Depending on details of the couple’s situation, it might even be worth “giving up” something else in order to reach this milestone. There is a modified benefit, called the 20/20/15 benefit, for spouses who were married for 20 years, whose sponsor served for 20 years, but whose marriage and military service overlapped for between 15 and 20 years. Under the 20/20/15 rule, the former spouse retains Tricare medical coverage for one year after the date of the divorce. Again, couples may want to consider the timing of the divorce if this coverage is important. The Survivor Benefit Plan (SBP) provides income to a designated person after the death of the military retiree. SBP permits a former spouse to be covered as an SBP beneficiary, either voluntarily or as designated in the property settlement agreement or divorce decree. Depending on the particular situation, SBP coverage can be a valuable asset. Be sure to consider former spouse SBP coverage as part of the overall settlement agreement, and put whatever is decided in writing in the divorce decree or property settlement. Be sure to inform DFAS within 1 year of the court order so that coverage can be appropriately applied. If either party in the marriage has debt, address it during the divorce. Keep in mind that creditors are not obligated to adhere to the terms of the divorce decree: just because a divorce decree says the debt belongs to one person does mean that the creditor can not enforce the other party’s obligation. If at all possible, pay off all debt together before dividing the other assets. If that is not possible, refinance or otherwise restructure the debt to be the individual responsibility of the person who is assuming the debt in the divorce. This will prevent any chance of an awful situation in the future. If a military member has transferred Post 9/11 GI Bill educational benefits to their spouse, that transfer is not cancelled if the couple divorces. Under federal law, however, GI Bill benefits can not be “divided” in a divorce. However, that doesn’t mean that the couple can’t come to an agreement with regard to the benefits, and base other decisions around that agreement. In this case, the receiving party may want to have contingencies built into the property and support agreement in case the military member decides to revoke those GI Bill benefits after the divorce is completed. This article is not meant to replace the advice of a good lawyer with experience helping military couples through a divorce. The two main points that you should take from this article are: a) it’s your divorce – you get to set the terms, unless you choose to let the lawyers fight it out or let it go to a judge, and b) there are several issues that are unique to military families, and you need to be sure they’ve all been addressed. Divorce isn’t fun, but it can be a lot less difficult if you understand what you’re doing. After a divorce where the spouse is granted 50% retirement pay (divorced in 2005), the military member retires in 2015 at age 47 when can or should the now 50yr old spouse begin to receive retirement pay? Hi Yvonne, the former spouse should begin receiving a court-awarded portion of military retirement pay whenever the service member begins receiving their military retirement pay. For active duty retirements, that is usually immediately. For reserve component retirements, that is age 60 or earlier if eligible for early retirement based upon certain operational requirements. I like your suggestion to discuss division of marital property in detail, including assets and debts. 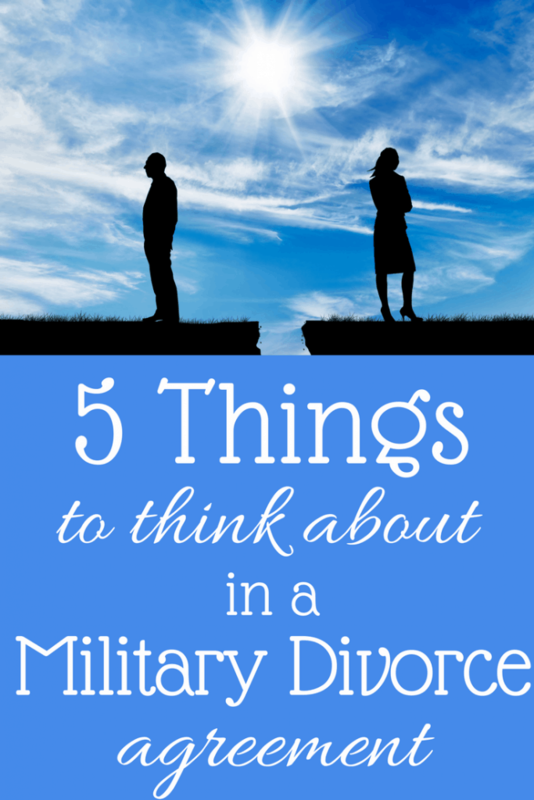 My husband is in the military and we’ve decided to get divorced. The advice you shared here should be really helpful; I’ll definitely talk with a lawyer about considering the details of our marital property division. Thanks for your blog Kate. My former spouse and I fall under the 20/20/15 rule but I don’t know the specifics. I enlisted in the Air Force reserves in 1987 and retired in 2009. We were married 1991; our marriage has an 18 year overlap with my military service. After our divorce, I moved to a different city. Her current military dependent id expired. I’m going to inquire if my ex spouse can get an id card only for the commissary. The commissary has been important because our children live with her, and she is shopping for the kids. Thanks. thank you so much for this article. I have benefited from the 20/20/20. I have had several friends divorce recently and sadly it is not the uncontested divorces described above. They have been very toxic, mostly due to PTSD, psychosis and other deployment related problems (infidelity, and a mix of any of those). For example in my divorce, he has been in contempt of court for years, but taking him to court would have become a career for me, resulting in the loss of tens of thousands of dollars by now, and of course hurting the kids greatly. Some further articles and a topic strictly for us on your page would be so greatly appreciated. I have an ID card and am now my own sponsor, but it is hard to navigate what benefits at large I might have, even with discounts. The SBP is greatly overlooked in divorce by everyone. It was not spelled out in my divorce but when I received my approval from the pay center of my entitlements they stated I would receive. I heard later on my ex had a year to change that if it is not part of the settlement. Is that true? I will receive a reduced amount but at least get something. You mentioned disability pay increasing retirement pay. Please verify, but I believe disability pay CANNOT be touched in settlement due to Federal law and the use that disability is paid for. I know that you get a small pay raise when you get married. My husband is the one who is active duty I moved back home in December. We decided we needed a divorce and he is trying to charge me for many things like using my phone until the divorce is settled. Is there any way that he should be giving a portion of the extra money he is making as he is married since he is not living at our house anymore or having to pay rent? Because to me it seems like he’s making money off me and pretending like he’s not when I ask him. I’m struggling on how to get all my stuff back home and it’s a long move and of course he’s not willing to help with the cost. Is that normal? I retired in 2014. Me and my ex spouse divorced in 2009. Our divorce decree doesn’t have anything in it that would state she would get half or a portion of my retirement. Can she take me back to court later to get a portion of my retirement if I already have a final judgment? That’s an interesting question. I would believe no, but I have heard of some situations in which former spouses convinced a court to reopen a division of property. Does your divorce decree reference it in any way? Does it reference any other retirement assets? Did she receive something else that would be considered to be in lieu of a portion of your retirement?